Originally known as “le parcours” Free Running is often practiced in urban areas such as gyms, parks, playgrounds, offices, and abandoned structures. With its philosophical roots in freedom of expression and movement, practitioners aim to move quickly and efficiently from one place to another, negotiating the obstacles in between, often in creative and playful ways. Join us at 12.45 prompt for a free running demonstration by James Dalby. 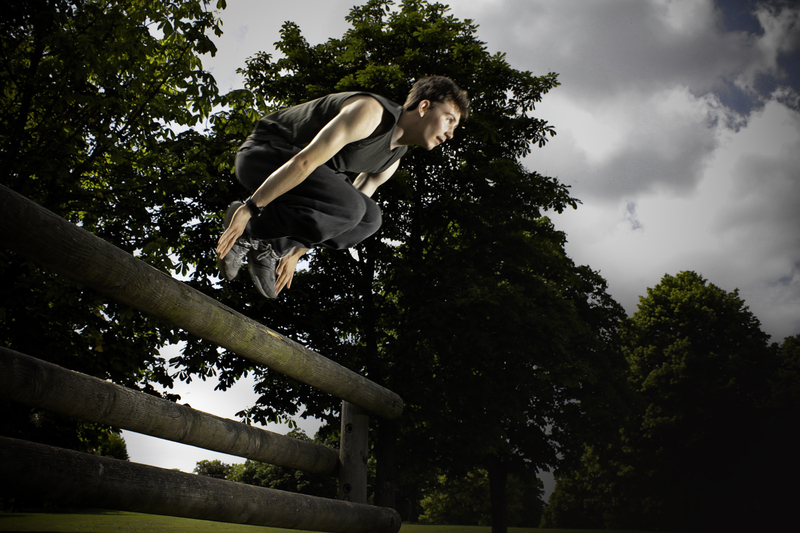 Participants will have the opportunity to try some basic moves at Knowle’s very own Free Running Park. The Park Centre, Daventry Road, Knowle, Bristol, BS4 1DQ. Follow this link for more information. Following the workshop we will take a short jaunt to the Knowle West Media Centre for a screening of Free Running Gaza directed by George Azar & Mariam Shahin. Free Running, Gaza depicts the thoughts and dreams behind the first Gaza Parkcour Team, an initiative of two 22–year–old friends, Mohammed al–Jakhbeer and Abdallah Enshsi. The short documentary follows the ingenious duo as they chart out new spaces to develop their sport, find new stunts to master, and use the internet to share their achievements with a global fraternity of “free runners”. If you intend to join us at 12.45pm at the Park to try or watch Free Running, then please bring comfortable and practical clothes. Running shoes, tracksuits, rain jacket… etc. For periods of the demonstration you will be watching others, so please bring warm clothing. If you have concerns about any pre-existing health conditions either email us, or discuss it with the practitioner on the day before taking part. For those just wishing to watch the film doors open at the Knowle West Media Studio at 2pm. £3 (+booking fee), book online here.